This article explains how to use your computer's hardware acceleration features to maximize Android Emulator performance. Visual Studio makes it easier for developers to test and debug their Xamarin.Android applications by using the Android emulator in situations where an Android device is unavailable or impractical. However, the Android emulator runs too slowly if hardware acceleration is not available on the computer that runs it. You can drastically improve the performance of the Android emulator by using special x86 virtual device images in conjunction with the virtualization features of your computer. 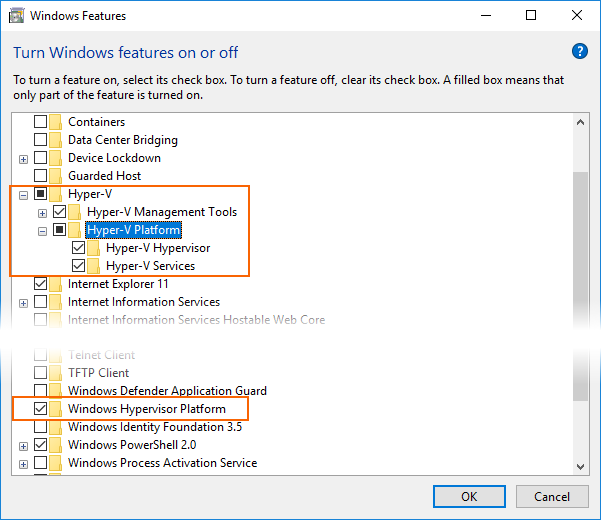 Microsoft's Hyper-V and the Hypervisor Platform. Hyper-V is a virtualization feature of Windows that makes it possible to run virtualized computer systems on a physical host computer. 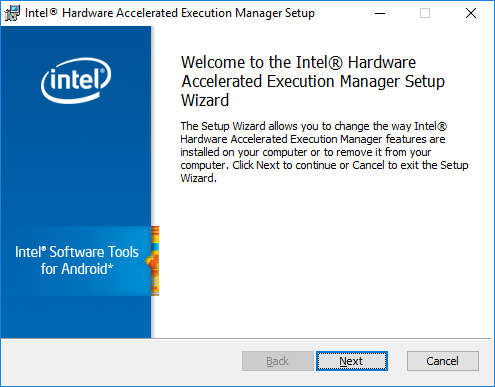 Intel's Hardware Accelerated Execution Manager (HAXM). HAXM is a virtualization engine for computers running Intel CPUs. Hardware acceleration is available and enabled on your development computer. The emulator is running a system image created for an x86-based virtual device. You can't run a VM-accelerated emulator inside another VM, such as a VM hosted by VirtualBox, VMWare, or Docker. You must run the Android emulator directly on your system hardware. For information about launching and debugging with the Android emulator, see Debugging on the Android Emulator. Hyper-V is the recommended choice for accelerating the Android emulator. Before enabling Hyper-V, read the following section to verify that your computer supports Hyper-V.
A 64-bit Intel or AMD Ryzen CPU with Second Level Address Translation (SLAT). CPU support for VM Monitor Mode Extension (VT-c on Intel CPUs). Virtualization Technology (may have a different label depending on motherboard manufacturer). Enter About in the Windows search box. Select About your PC in the search results. Scroll down in the About dialog to the Windows specifications section. After making these changes, reboot your computer. Install Visual Studio 15.8 or later (this version of Visual Studio provides IDE support for running the Android emulator with Hyper-V). When you create a virtual device (see Managing Virtual Devices with the Android Device Manager), be sure to select an x86-based system image. If you use an ARM-based system image, the virtual device will not be accelerated and will run slowly. Use HAXM to accelerate the Android emulator if your computer does not support Hyper-V. You must disable Device Guard if you want to use HAXM. If STATE is not set to RUNNING, then HAXM is not installed. If your computer can support HAXM but HAXM is not installed, use the steps in the next section to install HAXM. From the Intel website, download the latest HAXM virtualization engine installer for Windows. The advantage of downloading the HAXM installer directly from the Intel website is that you can be assured of using the latest version. For help with troubleshooting hardware acceleration issues, see the Android emulator Troubleshooting guide. Apple's Hypervisor Framework. Hypervisor is a feature of macOS 10.10 and later that makes it possible to run virtual machines on a Mac. Hardware acceleration is available and enabled on the development computer. Your Mac must be running macOS 10.10 or later. Your Mac's CPU must be able to support the Hypervisor Framework. If your Mac meets these criteria, the Android emulator will automatically use the Hypervisor Framework for acceleration (even if HAXM is installed). If you are not sure if Hypervisor Framework is supported on your Mac, see the Troubleshooting guide for ways to verify that your Mac supports Hypervisor. If the Hypervisor Framework is not supported by your Mac, you can use HAXM to accelerate the Android emulator (described next). 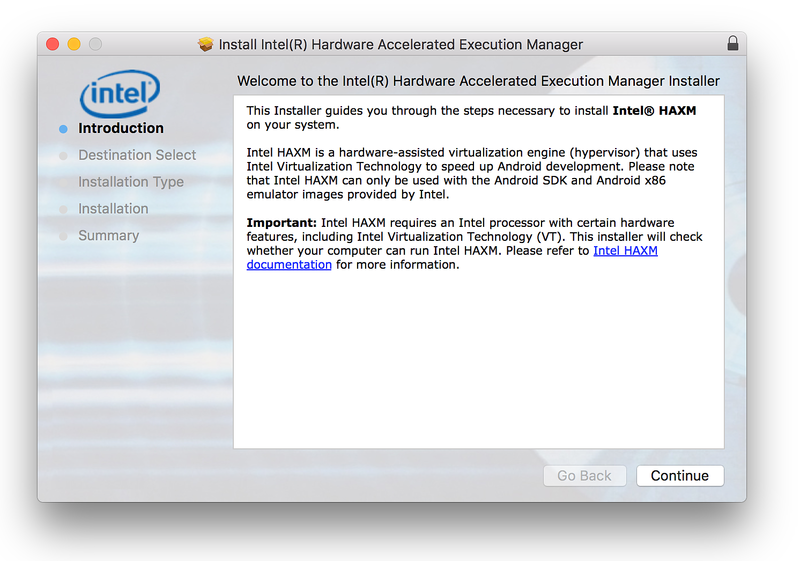 If your Mac does not support the Hypervisor framework (or you are using a version of macOS earlier than 10.10), you can use Intel's Hardware Accelerated Execution Manager (HAXM) to speed up the Android emulator. Before using the Android emulator with HAXM for the first time, it's a good idea to verify that HAXM is installed and available for the Android emulator to use. 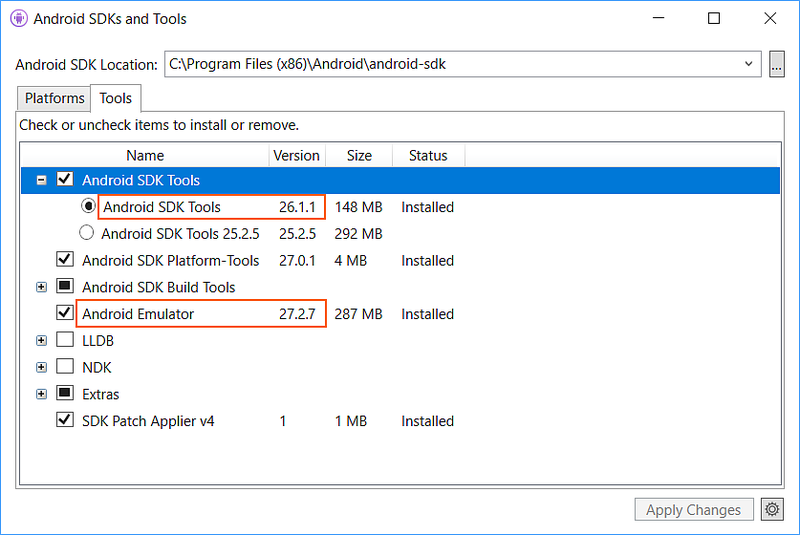 This command assumes that the Android SDK is installed at the default location of ~/Library/Developer/Xamarin/android-sdk-macosx; if not, modify the above path for the location of the Android SDK on your Mac. HAXM version 7.2.0 (3) is installed and usable. HAXM is not installed on this machine (/dev/HAX is missing). If HAXM is not installed, use the steps in the next section to install HAXM. From the Intel website, download the latest HAXM virtualization engine installer for macOS.